Background: Seasonal and circadian changes are two factors described to affect blood levels of some biological molecules. The Total Antioxidant Capacity (TAC) is one global measure of the antioxidant capacity of a system. There is no agreement about the existence of day/night changes in TAC levels as well as there is no information about seasonal changes in TAC levels. Objective: The aims of this research are studying if there are summer/winter changes in TAC concentrations or if TAC concentrations have day/night changes. Method: Ninety-eight healthy subjects took part in the summer study of whom 64 participated in the winter one. Blood was sampled at 09:00, 12:00 and 00:00 h. TAC was measured by the ABTS radical cation technique. Results are expressed in mmol/L of trolox equivalents. Results: The subjects had significantly higher TAC levels in summer than winter at the three-time point studied. Summer 09:00 TAC concentration was significantly higher than the 12:00 and 00:00 h concentrations (1.34±0.26 vs 0.83±0.19, 0.75±0.18). Summer TAC 12:00 h concentrations were significantly higher than the 00:00 h concentrations (0.83±0.19 vs. 0.75±0.18). Winter 09:00 TAC concentrations were significantly higher than the 12:00 and 00:00 h concentrations (1.24±0.16 vs. 0.73±0.10, 0.67±0.13). There were no significant differences between the 12:00 and 00:00 h TAC concentrations. 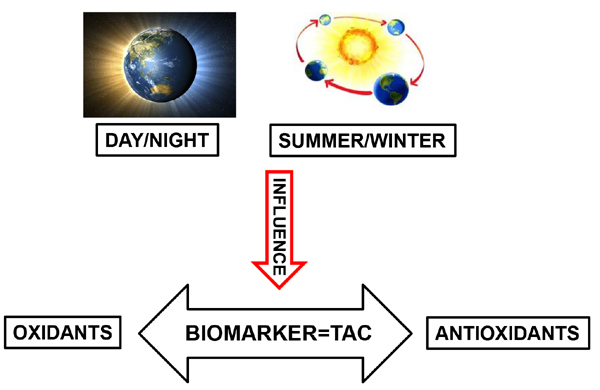 Conclusion: Strong methodological biases may be made if the seasonal and circadian changes in serum TAC concentration are not taken into account when researching in this area. Antioxidants, total antioxidant capacity, biological variation, seasonal rhythms, circadian rhythms, methodology.